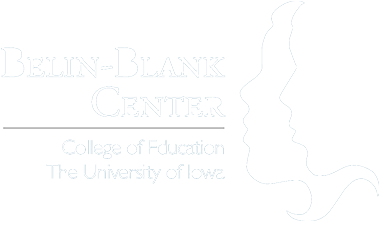 The Fall 2009 Journal of Advanced Academics included a study of self-concept (including overall happiness) in students who enter college early: Early Entrance to College and Self-Concept: Comparisons Across the First Semester of Enrollment (PDF), by Samuel Shepard, Megan Foley Nicpon, and Alissa Doobay of the Belin-Blank Center. Read the published proceedings (PDF) of a poster session on acceleration at the 2008 Wallace Symposium. Karen Rogers's updated meta-analysis of the effects of acceleration is the lead article. An article by Ryan Wells, David Lohman, and Maureen Marron in the Journal of Advanced Academics explores the factors associated with grade-based acceleration. You can read an abstract or the full article (PDF). 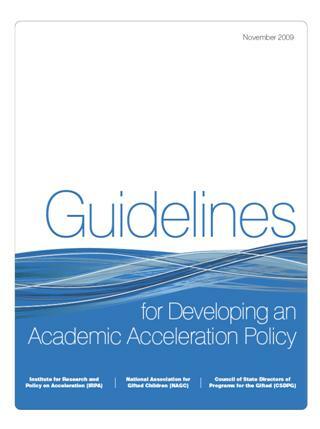 The Journal of Advanced Academics published Guidelines for Developing an Academic Acceleration Policy as an article in its Winter 2010 edition (PDF).